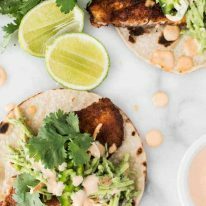 Blackened Fish Tacos made with a blend of Cajun spices makes these tacos that are absolutely loaded with flavour. A very special guest post from one of my all time favourite blogs, the uber-talented Kathleen from Hapa Nom Nom. One of my greatest sources of inspiration are food blogs. I am continually amazed by the creativity, wealth of knowledge and talent that is “out there” in the food blogging community. And one of my personal favorites is Kathleen from Hapa Nom Nom. Ever since the very first day that I stumbled across her blog by chance, I was hooked. Having tried quite a few of her recipes (scroll down to see my favorites!) and reading every recipe she publishes, I can tell you with absolutely certainty that Kathleen’s palette is very similar to mine. We both like strong flavours and enjoy diversity, discovering and sharing gems from around the world that are easy enough for anyone to make. Hi there! 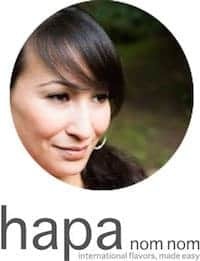 I’m Kathleen from Hapa Nom Nom. I’m so honored to be doing a guest post for one of my very favorite bloggers, Nagi as she’s traveling halfway around the world to Mexico and then onto California. There’s no doubt she’s eating some pretty incredible food while on her journey and I can’t wait to see what inspires her and how she’ll transform it into a RecipeTin Eats original! Today I’d like to share with you, Blackened Fish Tacos with Avocado-Lime Slaw. Anytime I’m at a restaurant and see the option to have something blackened, I jump on it! A blend of spices popular in Cajun cuisine, it adds serious flavor to anything it touches, and chances are you already have the spices needed in your pantry. I love making a big batch to have on hand for a quick and easy weeknight meal – tilapia, mahi mahi, shrimp, even chicken breasts all get a burst of flavor with this spice blend. 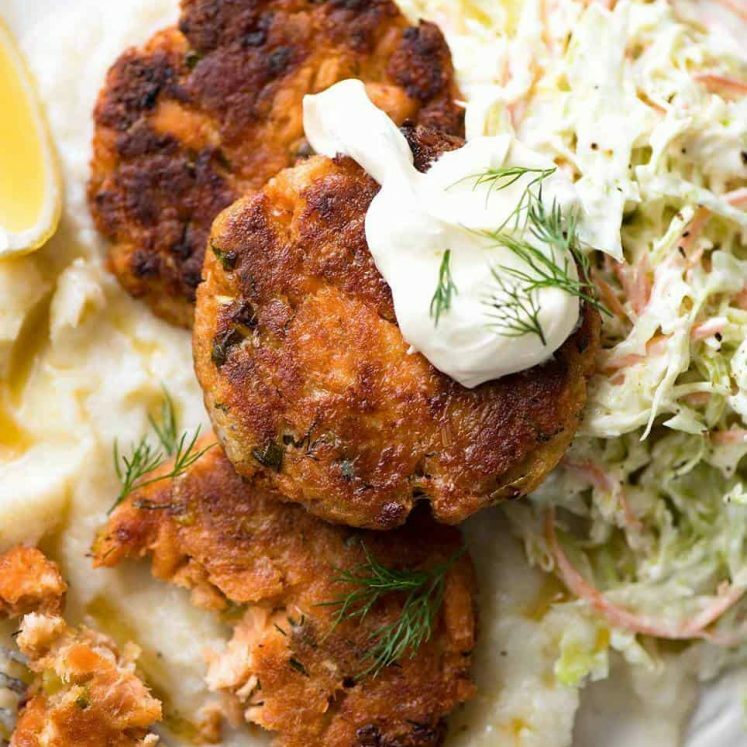 What’s even better – you’re adding an incredible amount of flavor without adding a lot of fat. Of course the fat I’m referring to is from the olive oil used to cook the fillets and that’s healthy fat, so another win for the dish! When it comes to the coleslaw there seems to be two camps – vinegar based and mayonnaise based. Personally, I’m team mayo when it comes to fish tacos. Rather than piling on veggies dripping with mayonnaise after I just went on about how you can get so much flavor without adding fat to the fish fillets, I thought it best to find an alternative. Enter avocado-lime dressing. A yogurt based sauce; it adds a cool, creamy texture with a zippy flavor – a perfect compliment to the bold spices of the blackened fish. Now because I just couldn’t help myself, I did end up adding a touch of mayo as a finishing sauce by making a quick Sriracha aioli. It’s actually pretty loose; as I’ve thinned it out a bit with lime juice – so you get a little drizzle of some of that flavor from the fat without big globs of it. Again, adding another layer of flavor to the dish. 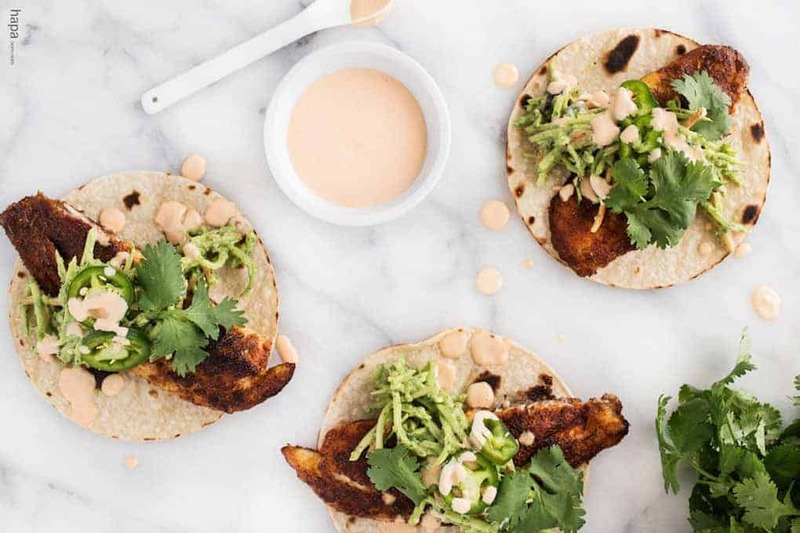 Fish Tacos – marinated and grilled, healthy and delicious! 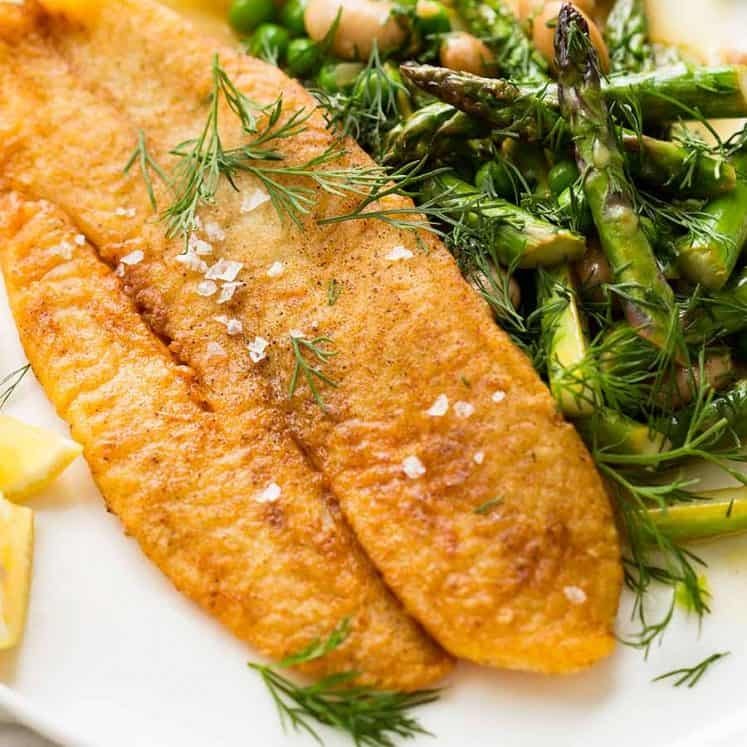 Fish cooked with a punchy spice rub of Cajun Flavours! Perfectly paired with a Avocado-Lime Slaw to make these irresistible tacos. In the bowl of a food processor, add the yogurt, avocado, cilantro, garlic, lime zest, lime juice, jalapeños, mint, salt, and pepper. Puree until smooth and creamy. Taste and add more salt and pepper, if needed. Place the shredded cabbage and carrots in a large bowl. Add 1/2 a cup of the avocado-lime dressing from the food processor and stir to combine. Add more dressing if you would like a creamier slaw. If not, you can use the extra dressing to top the tacos later. Refrigerate until ready to use. In a small bowl, combine the ingredients for the Sriracha Aioli. Refrigerate until ready to use. If you would like to toast the tortillas (highly recommended if you are using corn tortillas)* heat a pan over medium-high heat. Once hot, warm each tortilla 1 to 2 minutes per side – you want to heat the tortillas just enough to slightly char and add a bit of crispness, but not so much that when you fold it, it cracks. Wrap the tortillas in a clean tea towel to keep warm and set aside. On a large plate, combine all of the spices to make the blackened seasoning. Dredge both sides of each fish fillet in the spice mixture. In a large saute pan, heat the olive oil over medium-high heat. At the first wisp of smoke from the pan, add the fillets, working in batches if needed. Cook for 2 -3 minutes on each side. (Do not move the fish fillets around while they're cooking. Leave them be until they're ready to flip). Transfer the cooked fillets to a cutting board and slice each fillet in-half, vertically - making 8 pieces. 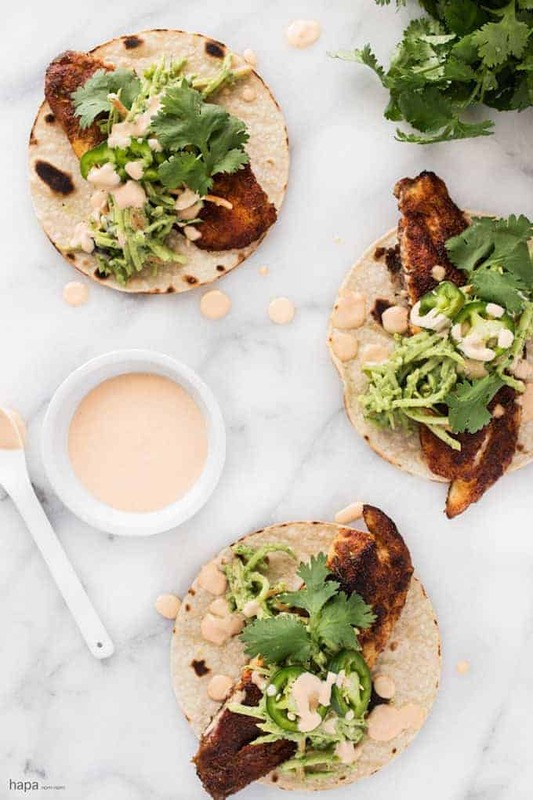 To serve, top each tortilla with the fish, avocado-lime slaw, jalapeños, cilantro, and drizzle with the Sriracha aioli. Serve with extra wedges of lime and enjoy! 1. 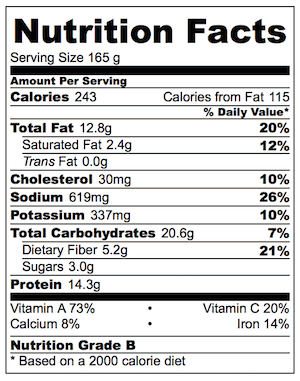 If you want to keep things super quick and easy, you can buy a bag of shredded cabbage and carrots at most grocery stores. The slaw can also be assembled the day before. 2. Heating tortillas on a skillet certainly adds a nice texture to your tacos. However, it serves a dual purpose with corn tortillas (not so much with flour tortillas). Corn tortillas easily fall apart - which is why if you don't heat them, they are generally served with two tortillas per taco. By very slightly charing the corn tortillas, you are making them stronger and more pliable. Careful - you don't want heat them so much so that they become crispy and break when you fold them. 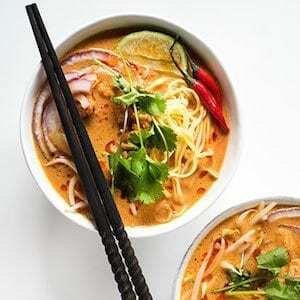 My all time favourite from Hapa Nom Nom is this Spicy Thai Curry Noodle Soup. My all time personal favourite is Kathleen’s Spicy Thai Curry Noodle Soup which I have made so many times I know the recipe off by heart. It’s a genius recipe because Thai Curries are actually quite time consuming to make and require speciality ingredients from the Asian store. 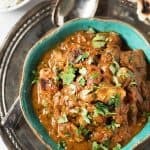 But this is made with ingredients you can get from the supermarket and it is far easier and faster to make than the usual South East Asian curries, but with the same BIG flavours! And here are my other picks from Hapa Nom Nom. It was tough only choosing 12! 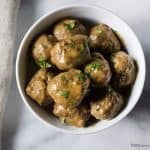 Swedish Meatballs – with her Swedish heritage, this is extra special! 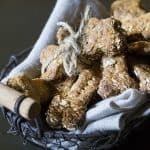 Homemade Dog Biscuits – on the list because DOZER approved! 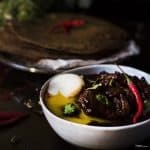 Doro We’t – National dish of Ethiopia, a spiced curry-like chicken dish. On my MUST TRY list! 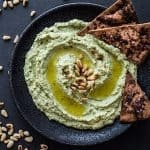 Super Green Goddess Hummus – guilt free hummus! It is SO good. 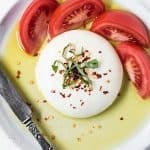 Homemade Mozzarella – who would have thought it was so easy? 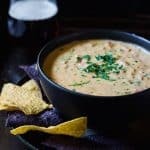 Queso Con Carne…because, well, you know…it’s cheese…. 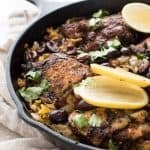 One Pot Morrocan Chicken and Rice – Because I’m a sucker for one pot dishes and this one ROCKS! 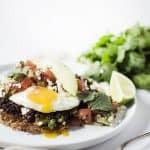 Hash Brown Breakfast Tostada – this is my kind of breakfast! 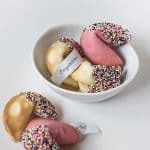 Homemade Fortune Cookies – what a legend, who would have thought?! 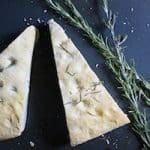 Focaccia – This is my “go to” recipe! PS Proof that Dozer LOVED the homemade biscuits! Wonderful recipe, so light and tasty, also i liked this!!! Ooooh, I loved looking through RTE to see a guest post from Kathleen! What a treat ! These tacos are so mouthwatering and I too am on team mayo, usually, but when it comes to tacos, vinegar is where it’s at! And Nagi, that curry noodle soup is divine, agreed! Beautiful photog, Kathleen! Thank you both for sharing…. and that Dozer, what a sweetie!! Isn’t Kathleen the best?? And her taste in food – awesome!!! Can’t get enough!! Fish tacos sound/ look fantastic . Can I substitute cod for the fish you used? Kathleen’s recipes are great, this one is perfect for me! Kathleen , it is so nice to see you here and just love this tasty fish taco with that Quick Sriracha Aioli. 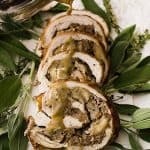 It is for sure to be a winner recipe in my house! I think even my fish hating teenagers might even love this and that is crucial. Nagi, seriously I don’t know how you could just pick just 2 of Kathleen’s recipes. I love all of them! Nagi, wishing you a super holiday and thanks Kathleen for your delicious recipe. Sharing and smoke signals sent! I’m a member of the Kathleen fan club too! Her recipes are fresh, vibrant and packed full of unique and tantalizing flavours. Not only that, her photography simply rocks! So happy to see her featured here, Nagi. Kathleen – when you make it big, can I say I knew you when? 🙂 Fabulous post! I can’t wait to try these. Love your recipes and this looks like a real winner. I can’t wait to see more of Kathleen’s recipes over on her blog too. Thank you. I don’t know Kathleen very well but I do know her recipes. I’m in camp mayo myself but the change up of the dressing on this recipe is perfect. Oh I as so happy to meet Kathleen — Nagi I trust your judgement on recipes — you have yet to disappoint me. 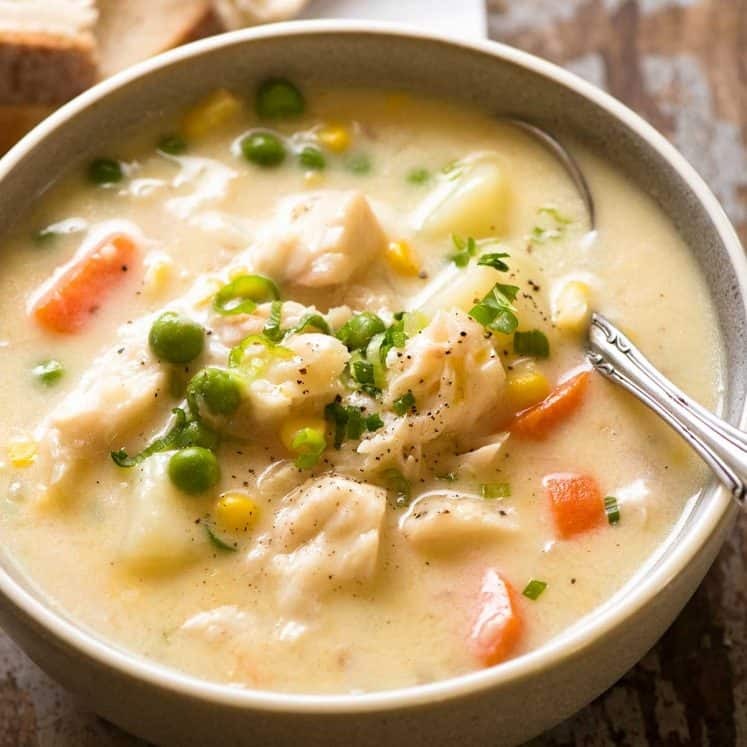 I also love strong flavors and isn’t it fortunate hubby and I just got back from the seaside where he caught scads of fish and now we have a freezer full. Can’t wait to make this recipe!!. No! You live a life I envy 🙂 Do you can your own fish? Oooh Nagi … you can’t be Kathleen’s biggest fan because I am!! Tee hee. What a wonderful recipe. So many incredible flavours. And that slaw – I’m sure I could eat a big bowlful of it all by itself. Beautiful. P.S. Hope you’re loving every minute of the trip! Kathleen this is an awesome guest post! 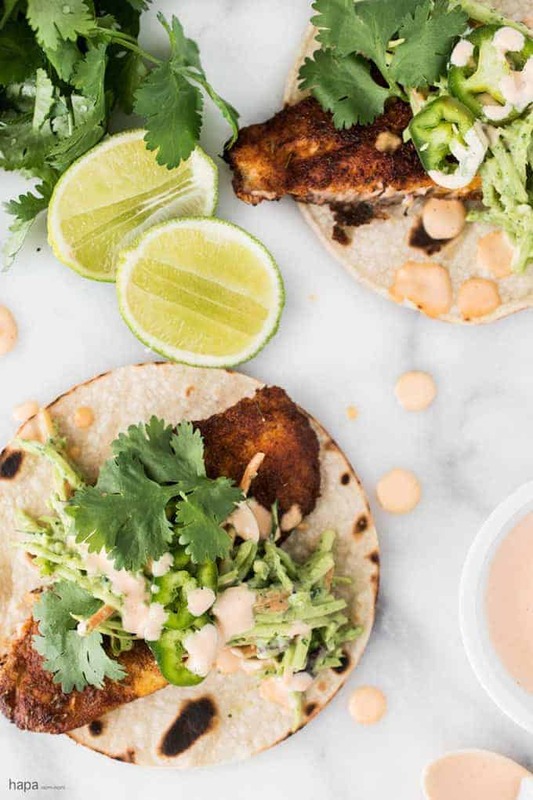 I love how you added the avocado-lime sauce to the cabbage slaw itself as a healthy yet creamy dressing, and the blackened fish marinade looks lovely 🙂 fish tacos are the best!! I love that dressing!! It’s actually really similar to sauce that is pretty much also provided at every restaurant here in Mexico! Hi Nagi and Kathleen! I became somewhat obsessed with Cajun/Creole food many years ago and I still am! We are having Cajun BBQ shrimp tonight! These will be on the menu here soon! Nagi, I can’t tell you how honored I was to create this guest post and I am truly floored by your incredibly kinds words. You have been such an incredible source of motivation and inspiration and I’m continuously amazed by the things you create. Best of all, you’re every bit as kind and lovely as you are talented. You seriously ROCK! I hope you’re loving Mexico! And oh my gosh, why haven’t I seen those pictures of Dozer – too cute! xoxo! Thanks Krista! It’s gorgeous isn’t it? Kathleen is a gem!